BBC ALBA has agreed the broadcast of all of the Scotland women’s national team’s upcoming warm-up friendlies ahead of their first ever appearance at the Women’s World Cup, held this summer in France. The first of the final warm-ups sees Scotland face Chile at the Pinatar Arena in Murcia, Spain, live on BBC ALBA at 6pm on Friday 5th April. BBC ALBA will also show Scotland as they face 2007 World Cup finalists, Brazil, on Monday 8th April at 7pm, again live from the Pinatar Arena in Murcia, Spain. Scotland’s final friendly, also live on BBC ALBA, will take place at Hampden on Tuesday 28th May, where they will be hoping for a record attendance for a proper send-off. Scotland’s group contains England, Argentina and 2011 World Cup winners, Japan. Scotland’s first game will be versus England on June 9th. All of Scotland’s group games will be broadcast live on the home of Women’s Sport in Scotland, BBC ALBA. 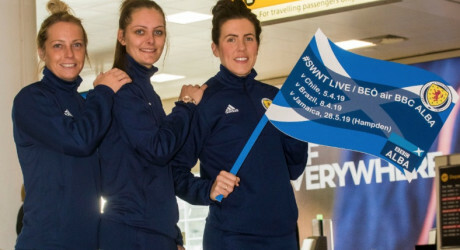 Broadcasting these games on BBC ALBA will offer the Scotland women’s national team a chance to gain further followers as momentum builds ahead of the upcoming World Cup. MEDIA RELEASE issued by Electrify Marketing & Communications. You too can share your stories (aka press or media releases), on this site. Email here for more information. Check out too twitter.com/allMediaNews and twitter.com/allSportsPR.